Occasional users have two non-binding options: the Fridays at the Studio or Occasional Printmaker Plans.
. Magnetic key giving free access 24 hours a day, 7 days a week.
. Drawer and storage bin on site. Non-member artists with printmaking knowledge allowing them to work autonomously can come to the "Fridays at the Studio" to work between 10 am and 4 pm. During this day, they may also receive technical support from the coordinator of their chosen workshop. Here is the schedule for the upcoming Fridays at the Studio where our workshop coordinators will gladly welcome you. Please note that Fridays at the Studio are on reservation only. 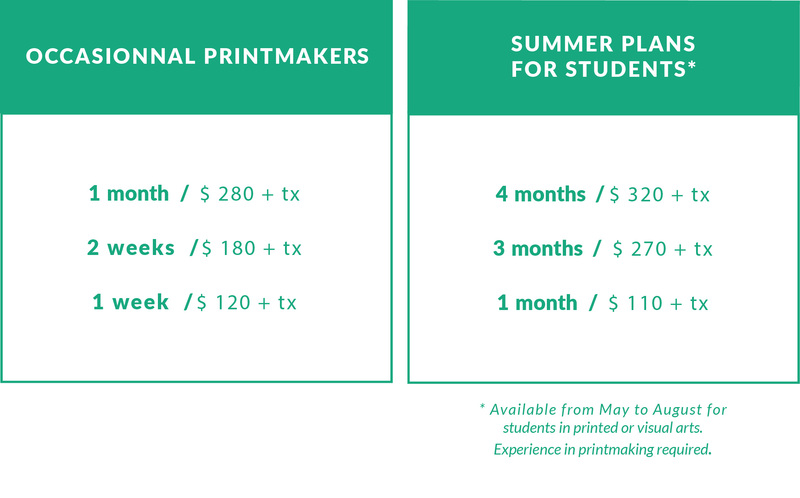 Digital printing and lithography are available every Fridays.